On the March 9, 2018 episode of Studio Stories (1pm) we talk to long-time islander, artist, and teacher Shirley Miller, pictured below in her studio. Below are a couple of paintings that we discuss during the show. 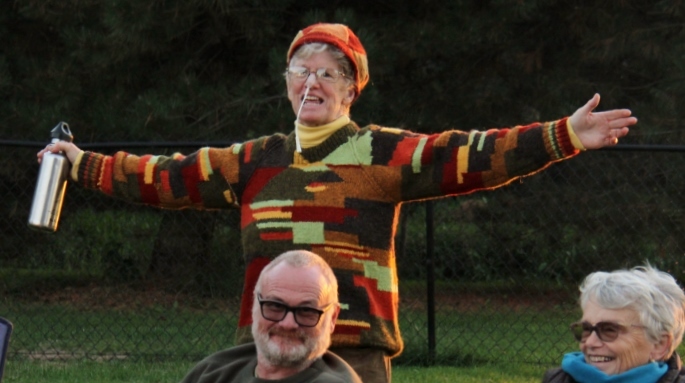 Find Shirley’s stories, photos and art online at one of her Facebook pages: Grandma from the Island Shirley Miller Shares and Amherst Island Looking Back. Lately I’ve been slacking on Lynn’s Lids felted goods creation because I have a new pet project… a podcast! Let me explain. I live on Amherst Island, which has a year-round population of about 400 people and swells to 800 or more in the summer. There are a lot of creative people who live here. Also, we have a tiny, volunteer-run radio station (CJAI 92.1FM) in the milking shed of a no-longer-used dairy barn, that is always looking for new shows to fill the local (also online) airwaves. So I thought it would be fun to do an interview show with a different artist or artisan on every other week. They thought it was a good idea as well, so this week is episode 4, and I made it into a podcast as well. For all of the details, either check out the iTunes podcast or go to cjai.ca/studiostories, where each episode has its own post with photos of the work of my interviewee, and links to their sites, if they have any. Click on the images below to visit their episode pages on cjai.ca. Episode 1 was long-time islander and artist Shirley Miller. Episode 2 we talked in the clay studio of islander Mayo Underwood. Episode 3 we went to Portsmouth Village in Kingston and talked to rogue quilt builder Annette Willis of Chasing Lightning Bugs. I’ve been asked many times about the Lego felter that my husband made for me (see Toys & tools), which I eventually killed as well as the AddiQuick. I don’t have the blueprint for it and I just did a search for more photos of it so you can try to build your own, but all I could find were the photos below. Sorry to disappoint. I am ever amazed at my friend Sally Bowen of Topsy Farms‘ strength, enthusiasm, and creativity. I buy my wool roving for all of my needle felting from Topsy Farms, but also have their blankets, lambskins, mittens, wool pillow and yarn for my dryer balls. I’m a big fan of their high quality, low processed products. The brand new Wool Shed will have their grand opening on the weekend of Christmas Shopping on Amherst Island November 19&20 10am-4pm, and I highly recommend you visit, for the wonderful products, people, and to see the beautiful new space! I’m a knitter with a bit of a difference – I do most of my work flat on my back in bed. I contracted Lyme disease 20 years ago. Undiagnosed for years, it prevented my digesting food, so I live dependent upon a feeding machine, ‘eating’ about 17 hrs/day. I wanted to spend some of that time being useful. It is hard emotionally to become very dependent and inactive, as I’ve always been a working participant in Topsy Farms sheep farm. So I was motivated to relearn to knit and crochet . Discovering this new way to contribute has been very important to my slow healing. In the afternoons and before bedtime (while my husband Ian reads to me) I knit. Ian started offering hand-made products with our blankets and sheepskins at Trade Shows. We now have a thriving on-line business and an active Wool Shed at the farm. I co-ordinate 10 piece workers who produce our items, but it is up to me to discover and test patterns and ideas. That’s a bit of a challenge for someone unable to go out and meet other knitters, participate in events and for someone as technically challenged as I. I’m slowly learning my way around Ravelry, as SereneSal (a statement of intent) but I’m overwhelmed by the riches of possibility. My biggest accomplishment so far has been this pullover sweater I made for myself. I learned how to make dryer balls, then found an extended family member far more artistic than I who could make them. (Roving makes an awful mess in bed). 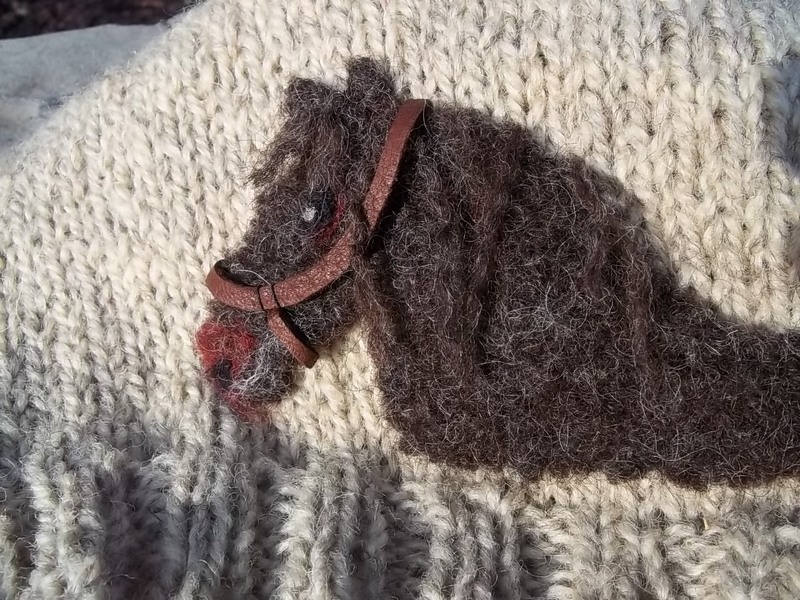 Needle felted ‘critturs’ hurt my neck and arm too much. A customer with more imagination (though not much more time) than I now makes them for us. I evolved our Topsy Socks knitting pattern borrowing from others, until it suited our yarn. We have 3 people who make socks, always adding polyester thread to heels and toes to strengthen the yarn. I don’t want to do repetitive work and have found others who like it. 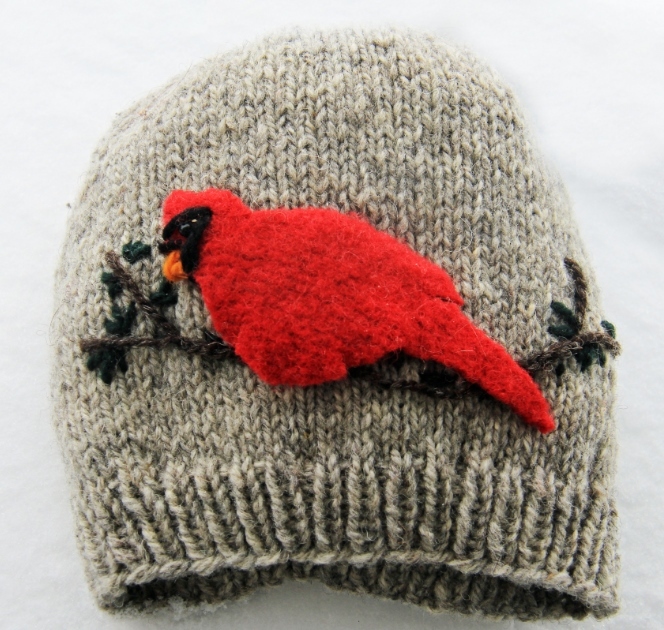 Three others, one in Montreal, do hats and thrum mitts, slippers and muffs and other projects. The logistics of getting supplies to them and product returned can be a challenge, as we live on an island, and won’t use mail to add to costs. Our great butcher, The Pig and Olive, provide a drop-off, pickup resource. Our appliqué hats grew out of my imagination. They can be fun for customers to discover. It is important to us all at Topsy to help promote the work of others in our Wool Shed. We carry only products sourced and created in Canada. Our wool bedding is from Alberta, our washable sheepskin and lambskin and our sheepskin mitts are processed and made in Ontario. Our 6000 lbs of wool clip are sent to MacAuslands in PEI, then returned as yarn, roving, blankets, throws, and lap robes. They are beautifully processed, using only soap to retain natural lanolin. Smaller producers are represented too: yarn bowls by an Amherst Island potter; sheep soaps from Ontario; a new fund-raising lost lamb book by a Kingston church group. Our own products are carried in an increasing number of locations too, with our yarn in Toronto exclusively at Yarns Untangled, but also in Peterborough, Stratford, and several locations in or near Kingston. Meanwhile, my pile of WIP’s (works in progress) threatens to increase, as new ideas come my way, and my speed, ability and time remain limited. It’s almost worth being driven to medical appointments (the main reason I leave home) as I can sit upright and knit in the car – it is faster and easier to follow patterns. But I’m glad my illness taught me to slow down, and to explore the creative possibilities knitting with our yarn. 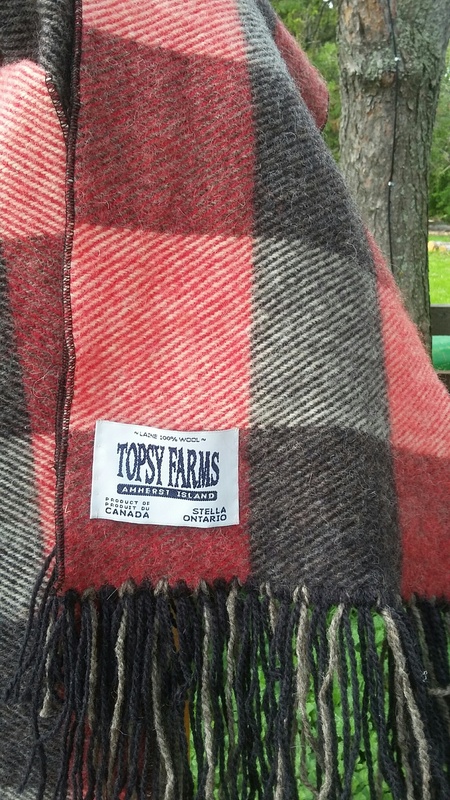 Check out Topsy Farms online on their website, Twitter, Instagram and Facebook, and in person at 14775 Front Road on Amherst Island. I have known Mayo Underwood for several years, thanks to the good people at Topsy Farms. 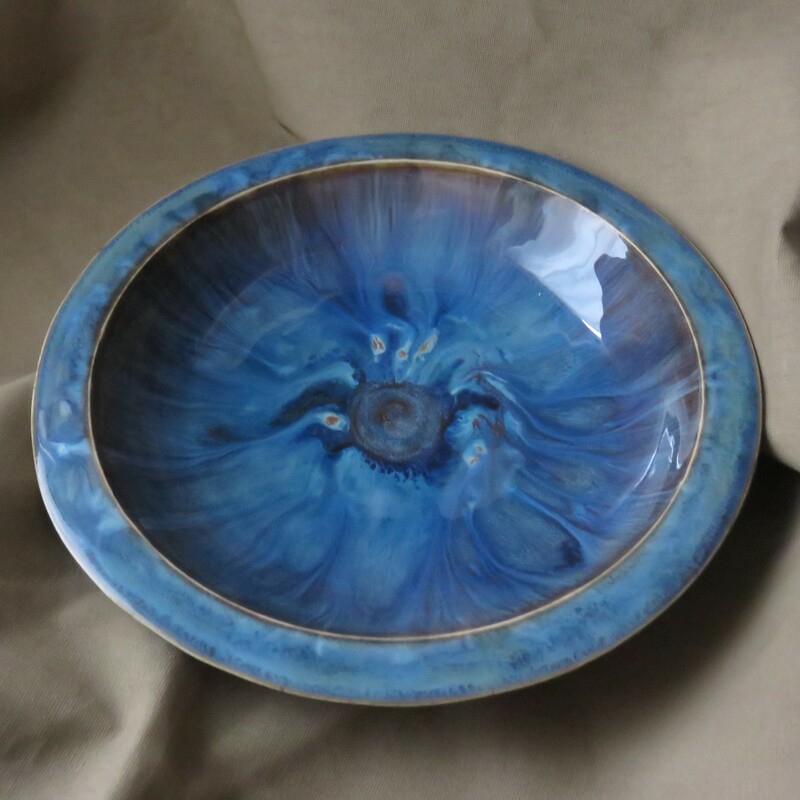 I am an enormous fan of her ceramics, and am rapidly growing my collection! 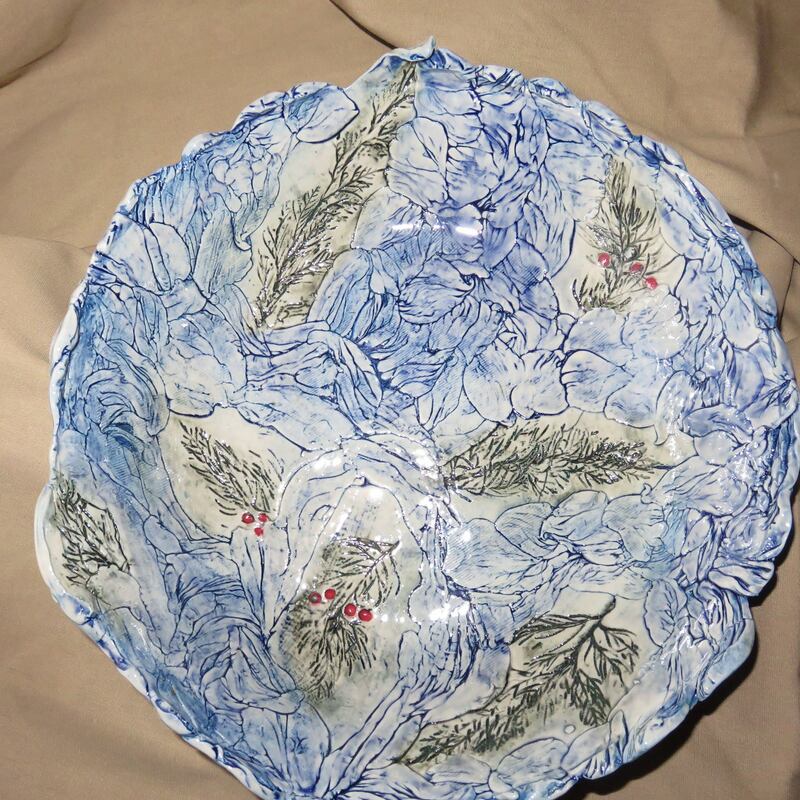 Mayo’s ceramics can be found at Christmas Shopping on Amherst Island at the Weasel & Easel (open Nov 19 10am-4pm & Nov 20 1pm-4pm), and at the Island Gallery & Little Gallery (Nov 19 & 20 10am-4pm). I pretty much taught myself how to throw a pot in my kitchen, using a neighbo(u)r’s not-too-powerful little wheel when my kids were toddlers. To keep my kitchen as clean as I could (working in clay can get quite messy), I used almost no water and developed my own way of ‘throwing dry’. It’s not a common way to throw pots and I eventually taught and demonstrated the method in the U.S. and Canada. Finding clay and getting to ‘play’ in it is something for which I’m grateful every single day. I wake up thinking about new ways to work with clay and different things to try. Something just evolved from one of my just-waking-up ‘what if’ moments. Now, as I’m beginning to produce these pieces, the pieces I make and put up for sale get bought almost instantly. I’m delighted that these new ‘friends’ are finding good homes! I hope y’all find something you love to do as much as I love playing in clay.